A White van mounts the sidewalk and drives into the tourist in La Rambla Barcelona, Spain. 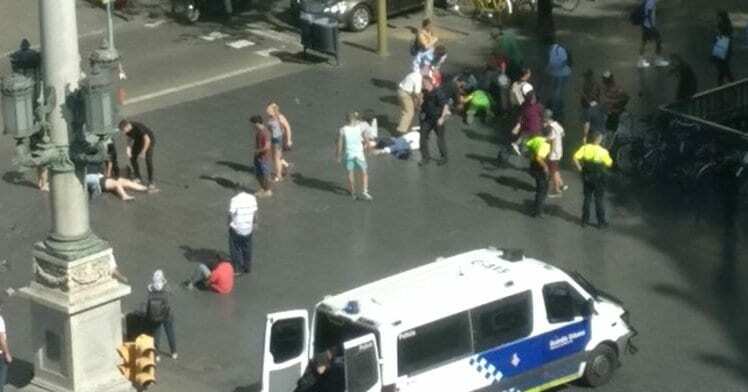 A van has ploughed into crowds on the La Ramblas in Bareclona Spain. La Rambla is a busy tourist area in Barcelona centre where thousands converge daily for fun activities. In a show of solidarity people are queuing up outside hospitals to donate blood. So-called Islamic State (IS) has claimed responsibility for the Barcelona attack, saying it was carried out by “Islamic State soldiers”. The claim has been made by the IS-linked news agency Amaq. The group gave no evidence or further details to back this claim. Spanish police say several people have been injured in what they are calling a “massive crash”. Emergency services are at the scene and trying to control the panic as well investigating the incident. Police in Barcelona say a white van has mounted a sidewalk, struck several people in the city’s Las Ramblas district. So far you can see the injured scattered on the floor with others trying to help them. SO far the Police have not released any information about the driver or the nature of the incident. The emergency services are urging people to stay away from the area around Placa Catalunya. Police have blocked off the area around broad street and shut down the stores whilst they attend to the injured.